Last summer the New York Rangers 2013 NHL Draft Class was not looking all that strong and with good reason. No picks in the first or second rounds, basically what was seen was players who fell backwards. Fast forward to Tuesday night and it is looking like Gordie Clark's scouting staff has found some prospects who are seriously looking like there is real promise to their potential. MacKenzie Skapski (NYR 2013 6th) struggled during the first half of the season with consistency issues and an injury that cost him time during November. 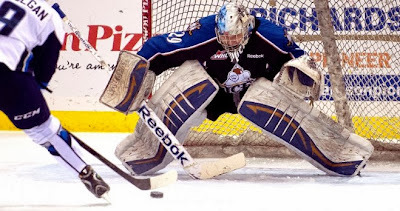 That was then and here is the now as Skapski won his 10th straight start in leading his Kootenay Ice to a 3-1 win over the Moose Jaw Warriors. The game's 3rd star, Skapski stopped 34 out of 35 shots in earning his 21st win of the season (21-13-2-1) and that is only beginning to tell the story of how much Skapski's game has come together. Skapski has given up 2 or fewer goals during his streak in 8 of those wins. In his last 5 starts Skapski is sporting a 1.60 goals against with a very strong 0.945 save percentage. The 6'3 192 lb goalie from Abbortsford in British Columbia is playing exactly as Kootenay was hoping he would at the start of the season when the Ice were hoping for a long playoff run. They just might get that thanks to the play of Skapski. Then there is Adam Tambellini (NYR 2013 3rd) who struggled while playing at North Dakota at the beginning of the season. North Dakota gave him chance after chance to keep Top 6 minutes but Tambellini just was not producing; just 2-2-4 with 31 PIMs in 16 games for North Dakota. Tambellini just wasn't finding his game at the NCAA leave for whatever reason and he wasn't looking good at all. Fast forward to January 7 when Tambellini announced that he was leaving North Dakota to play for Calgary in the WHL. Boy did just about every blogger and writer who covered Tambellini trash the kid for his decision (yes I will own my words too as I am one of those who trashed the decision). Tambellini to his credit has held steadfast as to why he left North Dakota calling it a "hockey decision" but nothing helps bolster your argument than your plan on the ice. Tambellini scored a goal as his Calgary Hitmen just had their way with the Prince Albert Raiders 7-2. Tambellini has a 4 game goal scoring streak going on with all 5 of his goals scored being power play goals. Tambellini has been pitching himself a tent in the slot area and nobody has been able to stop him lately. Even better was the goal he scored against the Raiders which was Tambellini cashing in a rebound for a goal, a trait he has been using more and more of in recent games. The Hitmen have won 4 straight games since Tambellini started on his goal scoring streak and overall he is now up to 9-11-20 in 16 games with the Hitmen. Ryan Pulock (NYI 2013 1st) was the only New York Islander prospect in action and judging from how badly Pulock and his Brandon Wheat Kings looked against the Medicine Hat Tigers, they should have stayed in Brandon. Medicine Hat spanked Brandon 6-1 and they didn't even look like they had to break a sweat doing it. Pulock was scoreless but a -3 for the night as Medicine Hat played an almost perfect game to win. Brandon who now have dropped 2 straight are picking the wrong time of the season go into a slump.